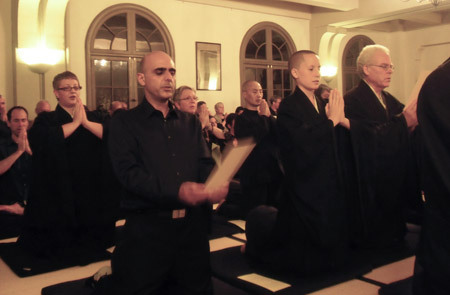 On the evening of Wednesday, September 4, eight students received lay ordination in a City Center ceremony in which they vowed to refrain from all harmful conduct and save all beings, among other impossible but inspiring missions. 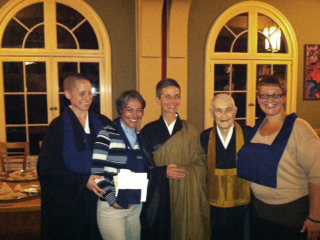 The sangha was delighted to extend gratitude and congratulations to this courageous group. Ordainees, from left to right, front row: Maurice Mogannam, Kim Bress, Michael Smith, and Valerie Harris (not pictured); back row: Heather Ites, Dawna Foreman, Eric Sergee, and Camila Torres (not pictured). Preceptors included Senior Dharma Teacher Zenkei Blanche Hartman, Central Abbot Myogen Steve St�cky, and Tokuden Shinki Mark Lancaster. From the above group, these students of former City Center resident Myozen Joan Amaral (now leading Marblehead Zen Center in Marblehead, Mass.) also studied with Zenkei Blanche Hartman, who was their preceptor Wednesday evening. From left: Kim Bress, Camila Torres, Joan, Blanche, and Heather Ites.